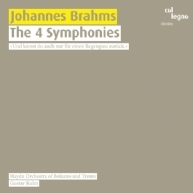 First the Beethoven delirium, now the Brahms fever: following their sensational success with the complete Beethoven symphonies, Gustav Kuhn and the Haydn Orchestra of Bolzano and Trento continue with the complete symphonic works of Brahms. A logical sequel, given that already conductor Hans von Bülow, a contemporary of Brahms, claimed that Brahms' first symphony actually was Beethoven's "tenth." Brahms himself used to feel a symphonic discomfort about "always hearing a giant like Beethoven marching in his wake." But then the late Romantic composer went for it, four times all told, and guided the symphonic genre from the classic into the future, as Kuhn and his orchestra demonstrate in an impressive performance: a differentiated chamber-music display combined with a prophetic orchestral gesture, enabling the listener to experience Brahms' symphonies in all their facets.